In May 1922, Dorothy Thompson, reporting for the Philadelphia Public Ledger and its syndicate, wrote a feature article on the disappearance of Vienna’s coffee houses. She suggested that the closing of many such establishments represented the passing of cafes from the lives of Viennese. She saw the demise of the coffee houses resulting from the disappearance of the old bourgeoisie (because of the poverty of the middle class) and from changing tastes of workers who were interested in other kind of entertainment – often involving wine and schnaps. Also she found that artists were going less often to cafes, mainly because successful ones had become snobs and the others could not afford the entrance fee -- a cup of coffee. 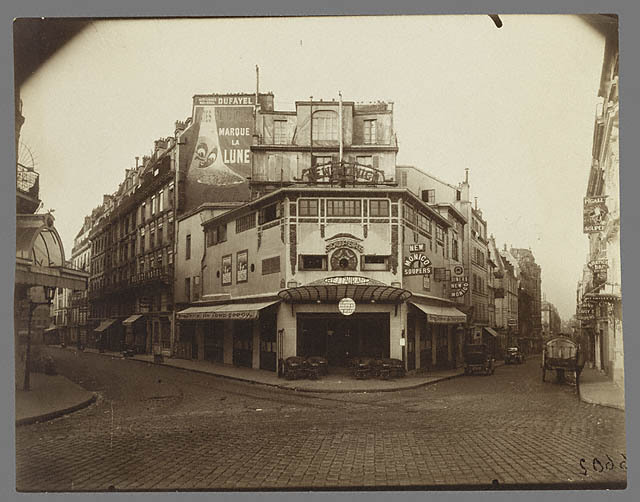 Thompson’s article pointed to the passing of Vienna's coffee houses as “another sign of the decay which is everywhere apparent in the city.” Then she recounted the importance of coffee houses for Vienna’s great composers, writers, and artists. She mentioned the cafés preferred by Beethovan, Mozart, and those frequented by writers such as Grillparzer and Schnitzler. She went on to write about cafés preferred by famous artists of the day. In doing so, she provided a good guide to Vienna cafés that had hosted the intellectuals of the city in the past and many that continued to do so in 1922. When Thompson wrote this article, she had been reporting from Vienna for about 18 months. She had arrived in late February, 1921 to write for the Philadelphia Public Ledger. Her story is one of improbable success. At the age of 27, in June 1920, she and a friend had set sail from New York for London with about $500 between them. They had a plan to support themselves by selling stories to American newspapers. Neither had previously worked as journalists. It was quickly clear that Thompson had both a knack for reporting and the enormous drive needed to succeed. It didn’t hurt that she was as attractive as she was energetic. At first, she worked part time writing press releases for the Red Cross in London, then in Paris, to help support herself as she wrote stories to sell to newspapers. She had some notable successes as a freelancer and soon caught the attention of American editors working in Europe. In January 1921, she convinced an editor for the Philadelphia Public Ledger to give her credentials as its correspondent in Vienna. She agreed to be paid “space rates,” which meant that she received no salary, but was compensated based on the inches of her articles published by the paper. Her output was so prodigious that in May 1921, she was promoted from “space rate” to a salaried reporter. That was her status when this article was written. Thompson stayed in Vienna until in the middle of 1925 when she was promoted to be chief of the Philadelphia Public Ledger’s bureau in Berlin. Her career as a daily reporter ended in May 1928, when she married novelist Sinclair Lewis. In the following eight years, she wrote articles for numerous newspapers and magazines (including the Saturday Evening Post). She lived in Vermont, but made frequent trips to Europe to gather material for her articles. In March 1936, Thompson was hired by the New York Herald Tribune to write a syndicated column, which she titled “On the Record.” It was published three times a week without interruption for 22 years. At the height of its popularity, the column was read by 8 to 10 million people each time it appeared. In the 1939, Dorothy Thompson was recognized by Time magazine as the second most influential woman in the United States. Eleanor Roosevelt was deemed the most influential. When Thompson wrote about the passing of coffee houses in mid-1922, Austria was in the middle of a great devaluation of its currency, economic times were difficult, and the outlook for the nation was grim. Paul Hofmann in his book The Viennese mentioned that many coffee houses went out of existence during this period. So, Thompson was reading in the newspapers of the closings and decided that they would continue. Fortunately, these businesses were much more resilient than she expected. When the Viennese could afford it again, they returned to their Cafés again. The Austrian economy picked up after currency reforms in 1923 and 1924. After that, Vienna cafés thrived until most were forced to close following the German-Austrian Anschluss in 1938. Although, Thompson’s article may not have accurately predicted the future of Vienna’s coffee houses, it did provide a good description of their role in the lives of famous and not-so-famous Viennese. A copy of the typed manuscript of the article written for the Philadelphia Public Ledger is in the Dorothy Thompson Papers at the Special Collections Library of Syracuse University. An annotated transcription of this manuscript (which is out of copyright) follows. During the past few weeks the Vienna press has carried every few days an announcement to the effect that this or that café would close after a certain date because it was no longer making money. This wholesale shutting down of coffee houses has attracted attention to what has been going on in greater or less degree during the past two years. The Vienna coffee house is passing. This is only another sign of the decay which is everywhere apparent in this city which was once the Paris of Central Europe, and perhaps the common sense man will hold it frivolous to bemoan the death of this particular institution in a city so bowed with serious grief and deprivations. But no institution in Vienna has played a more charming part in its history, and all true lovers of the home of Beethoven, Mozart, Brahms, and Johann Strauss must experience a peculiarly poignant regret that the coffee house, symbol of “gemutlichkeit”, that untranslatable quality which means comfort, tolerance, good humor, kindliness, and hospitality, all in one word, is passing. With the passing of the café, goes, one feels, “Alt Wien”, gay, artistic, sentimental, lovable; whose spirit has persisted stubbornly, in spite of the peace treaty, the dismemberment of the country, and the frightful poverty, down to this very day. In Vienna, as in Paris, the coffee house has always been very closely related to the artistic life of the city. The old Paris Bohemians, recently mourned by Clement Vautel1, in the columns of the Paris Journal, had their favorite cafes, and have perpetuated their names in immortalis. The Closerie des Lilas2, on the corner of the Boulevard Montparnasse3 and the Avenue de L’Observatoire, opposite the entrance to the Petite Jardin, will be remembered by everyone who knows the poems of Paul Verlaine4. George Moore5 in his memoirs of Manet, Monet, Degas, the great French impressionists, has made the Nouvelle Athene6 as familiar to us as the Louvre. And so, in Vienna, one may find in a dozen little coffee houses which it is a particular job to hunt down in their little side street, intimate memoirs of Beethoven, Brahms, Schubert, Mozart, and of the King of Light Opera, Johann Strauss. Like the Cafes of the French artists, these rendezvous of the Vienna musicians are usually small, sometimes even squalid, full of little stained marble topped tables, with dark corners where one may sit over a Kaffe Schwartz or a kummel7, and dream of the glorious old days when the world’s masters sat here also. Shubert’s favorite rendezvous was “Die Silberne Café”10, a little hole in the wall in the Plankengasse, near the Neue Markt. The great opera singer, Maria Jeritza,11 has an apartment within a stone’s throw of this place today. Beethoven used also to come to “Die Silberne Café” to meet his friend Schubert, and Schubert’s great crony, Grillparzer, the famous Austrian playwright. You may not enter the Silberne today. Its doors are closed, probably forever. Vienna is mourning the twenty-fifth anniversary of the death of Brahms, and is playing his music in all the concert houses night after night. One cannot think of Brahms, in Vienna, without instantly seeing in the mind’s eye the Karl’s Kirche, that strange but effective hodge podge of architecture in the neighborhood of which Brahms lived. He loved that church, and remarked upon the beauty of its great green dome and its two weird round towers, which always seem other-worldly in the Vienna twilight, on the very night that he died. The Karl’s Church, and the Café Apfel12 one always associates with the great master. The Café Apfel is just behind the Technical High School, and in the old days was almost entirely frequented by students. Nevertheless, Brahms spent almost every afternoon there, in the company of his three bosom friends, Makart and Cannon, the painters, and Tilgnor, the sculptor.13 Day after day these four artists played a game of billiards with skittle, while the little students looked on. Johann Strauss, of Blue Danube frame, whose spiritual children are legion in Vienna – does not half the light opera of the world still hail from here – was another coffee-house habitué. He used to meet his friends every afternoon in the Café Dobner14, on the Linke Wienzeile. The Café Dobner was, and is, a rendezvous of actresses and actors, now indeed of motion picture starts and of variety-show artists. The artists “Stock exchange” is here. At every Easter time all the provincial actors, seek, find, and renew engagements around the little marble topped tables. Johann Strauss used to play billiards here with the two great comedians, Girardi and Blasel15. Poor Girardi. He married the great Helene Odilon16, Vienna’s favorite of the moment, an actress of the Burg Theater (The National theater) but she, becoming enamored of a rich man, sought to divorce him, and failing would have committed him to an insane asylum had not the Emperor, Francis Joseph, interfered himself. It was Katarine Schratt, the Belle amis of the emperor, and an old friend of Girardi’s to whom the persecuted man went for protection. There was a scandal and the rich lover dropped the pretty Odilon like a hot cake. Not that that mattered much to Odilon, in those palmy days. How long ago they seem; and yet they were not long ago. Strauss is dead, and Girardi is dead, but Odilon still lives. I saw her selling postcards the other day in the Hotel Bristol. I shall tell all of her story one day for the Public Ledger. The coffee houses are closing, and in any event, they are not what they were. For one thing the modern Vienna artist is not so bohemian, so careless, so democratic, as the great old masters were. When they become famous, they likewise become prosperous – in foreign valutas. The great Richard Strauss, who wields his baton over his own operas – Salome, Rosencavelier, Electra, Die Frau Ohne Schatten – in the state opera, goes also to America, plays in the New York symphony, and to England. He is an elegant gentleman, and one does not think of him in the corner of some dingy little café. Nor does one see him there! Young Korngold, whose opera “Die Tote Stadt” introduced the great Jeritza to America last autumn, is not so much an arrive, and is by nature, simple and democratic17. So he keeps alive the old tradition, and patronizes the coffee house. And the musical comedy writers, who compose half the arias which we hum to ourselves, as we leave our offices or make the beds, or saunter down the street, in London, or in New York, or in Kalamazoo, remain faithful to the coffee house to the last. The Café Museum is their rendezvous.18 It is in the Opern Platz, a stone’s throw from the offices of the American Relief Administration. Here still come Franz Lehar, the composer of “The Merry Widow”, and of “Gypsy Love”; Leo Fall, composer of “The Dollar Princess”; Kalman, who wrote “The Gypsy Princess” and Oscar Strauss, of “The Waltz Dream” and “The Last Waltz.”19 Reinhardt, the great Berlin theater director always looks into this café when he is in Vienna.20 For twenty years a table has been reserved in a quiet corner of the big room, where the musical comedy composers gather. Many a song has been scribbled off in pencil on the marble table. Futurist and expressionist painters, the young artists of Vienna, also make the Museum a rendezvous. Most painters, however, patronize the Café Payer21, a coffee house in the vicinity of “The Secession”, the gallery where these painters who are neither academic nor radical, exhibit their work three times a year. Here you can find Gerstenbrand22, the artist who made the drawings on this page, when you don’t find him in the Secession itself, or in the tiny café under the exhibition room. He complains bitterly that the Payer is not as it was of old; bourgeoisie (like myself) with mere money come in and are waited on. In the old days it was sufficient to be an artist or a man of letters to get the promptest service – if you couldn’t pay, well, perhaps you could next week. But there is no longer any culture in Vienna! So they wail, the artists, and for revenge, draw sketches of the “Schieber” (Profiteer) patrols on the marble-topped tables, exaggerating paunches and jaws. When the proprietor comes to their table for a hearty “Good Day,” they slip the little metal tray which holds their Turkish coffee, water glass, and liqueur over the sketch. If he discovers it they must treat him to a Schnapps. The artists are the poorest, and the gayest, the most Viennese people in Vienna. Among the playwrights and novelists who love the coffee houses are Arthur Schnitzler, whose sixty-fifth anniversary is celebrated this month in Vienna, with revivals of his plays in all of the theaters, and Franz Molnar.23 Molnar is a Hungarian, but when he come to Vienna, as he occasionally does, for a rehearsal or a premier of one of his plays, he spends his free time in a coffee house. Schnitzler’s favorite coffee house, in the Herrn Gasse (sic) is nicknamed “Café Conceit.”24 There is something Shavian about Schnitzler25. He does not hide his light under a bushel. But the artists cafes are only one branch of this remarkable institution. There are special cafes for journalists. The Café Landmann (sic) is one. Here you may get the world’s newspapers, receive phone calls, leave message with your own particular waiter, keep office hours, write copy, get a messenger boy to post your telegrams26. The Vienna journalist makes the café workroom, reading room, club and home. The low bourgeoisie have their cafes also. Perhaps the Café Frauengruber is the best surviving example of his type of coffee house.27 Here grocers and cobblers play cards, usually the famous game of Taroque, beloved by the old Austrian emperor. Here from time unknown the small tradesman has drunk his beer and eaten his cheese, hugged the waitress, and sometimes given her a smacking kiss, listened to a lone violinist, smoked his “Virginia” cigar, a singularly long thin weed, and complained about the bad and changed generation. The People’s Cafes are a step lower in the coffee house social scale. Here the music may be furnished may be furnished by an accordion, and the intimacy between the guests and waitresses is even more genial. And, alas, there is still another café: the Schieber café.28 That, too, is passing, as the profiteers, who, at the close of the war made considerable fortunes in smuggled goods and illicit trade, become absorbed into legitimate commercial life. I can remember the Café Atlantis, however, a year ago. It is a great gaudy, showy place, on the Ring, opposite the Imperial Hotel, the last place you would look for anything illegal. Yet here, for a flick of the eyelid toward the waiter, you could be put in touch with someone – at a neighboring table – who would sell you anything you liked, or buy from you anything you had to sell from old clothes to goblins. I remember a little black haired Italian girl, who used to flit from table to table. People told us she was the greatest illicit trader in East Europe, and that through her hands passed art treasures, old furniture, pictures, bronzes, porcelains, and what not. She made a fortune in buying objects d’art in Vienna, at the Café Atlantis, and selling them in Italy – to American tourists. One could even buy passports in the Café Atlantis, if one came with the right legitimation. Why is the coffee house passing? Are the artists all becoming snobs, when successful, and if unsuccessful are they too poor for even the cup of coffee which is the only entrance fee? Is the old bourgeois passing? But certainly it is; it is almost dead, and the new middle class likes better the movies and the dansarts in the Hotel Bristol. Even the workers, who are better able, at present, to afford the coffee house than the impoverished middle classes, look for amusement elsewhere. Times are hard in Vienna; there is the maddening fear always, that tomorrow the almost worthless money will be quite, quite worthless; for today is it well to drown ones fears – not in coffee, but in wine, or schnaps. The decline of the coffee house is marked by the rise of the saloon – in its specific Viennese form, The “Heurige”. But the growth of the “Heurige” is another story. 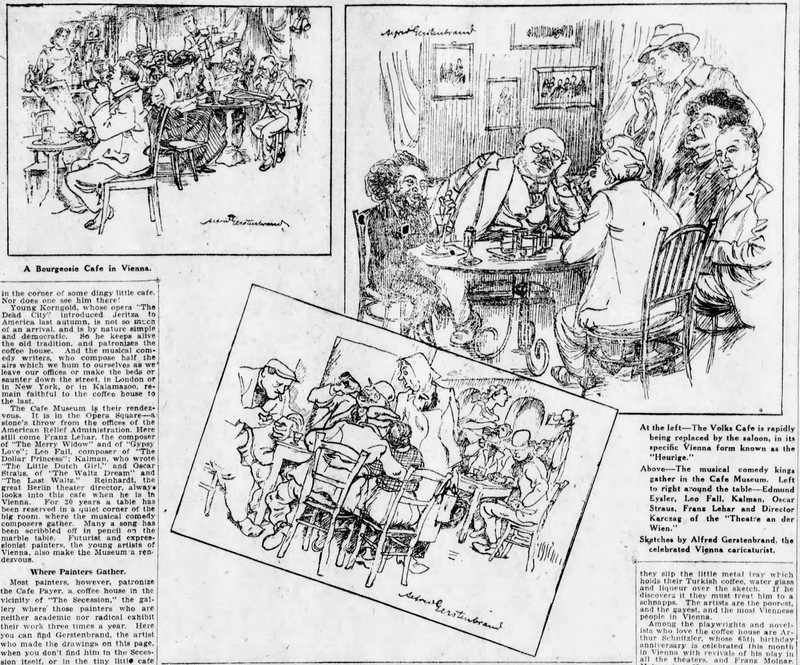 These are the Alfred Gerstenbrand sketches used to illustrate Dorothy Thompson's article published under the headline "Passing of Vienna's Coffee Houses, Where Geniuses Met, Sign of Decay in Erstwhile Paris of Central Europe". In The Brooklyn Daily Eagle, June 18, 1922, p. 70. 1. Clement Vautel is the pseudonym of Vautel Clement (1876-1954) French journalist and author. 10. Located in the 1st District, Die Silberne Café (Die Silberne Kaffeehaus) was opened in 1808. It was famous for serving coffee and food using silver carafes, platters, and other service items. Also, coats were hung on silver coat hooks. This café was the first literary café where famous authors (e.g. Grillparzer and Raimund) came regularly. 12. I have no information about Café Apfel. It was located close to the Musikverein, which is near Karls Kirche and the old Technical High School. 21. This café was still in existence in 1930. 22. Alfred Gerstenbrand (1891-1977) was a painter, lithographer, and illustrator. He joined the Secessionist movement, then later joined the Wiener Kunstlerhaus, where he was a professor from 1935 to 1951. Some examples of his art recently sold at auction can be seen here: http://www.artnet.com/artists/alfred-gerstenbrand/past-auction-results. Note that some of his illustrations were sent with Thompson’s article to accompany it. 24. Likely “Café Conceit” is the famous Café Central. It was located on Herrengasse and reopened there in recent years. Schnitzler was a regular at Café Griensteidl until it was abolished in 1897. 25. Shavian means in the manner of George Bernard Shaw, who apparently was not a shrinking violet. 26. The Café Landtmann, located on the Ring next to the Burgtheater, is still a popular attraction in Vienna. See its website here: http://www.landtmann.at/ and a short history here: http://en.wikipedia.org/wiki/Landtmann. Later in the 1920s, Café Louvre became the regular meeting place of Anglo-American journalists in Vienna. 27. Likely Thompson meant Café Frauenhuber, located on Himmelpfortgasse in the 1st District. It still exists and is one of the oldest cafes in Vienna and probably the oldest that has been continuously operated. The website for this café is http://cafefrauenhuber.at/. A short historical note about the café is found at http://de.wikipedia.org/wiki/Caf%C3%A9_Frauenhuber. 28. “Schieber café” is not the name of a café, but refers to cafés where profiteers and black market traders met to make deals. An earlier article by Thompson (published in August 1921) described in some detail the dealings at Café Atlantis. What an interesting article, although a trip to modern Vienna suggests the coffee houses are still very much alive! That said, it is hard to avoid a certain sense of loss in the present-day city: the museums are full of work from that incredibly fertile creative period before the first world war, but the vibrancy is no longer there (Freud actually called it "sperm in the air"). I wrote about my weekend in the coffee houses here. Thank you for your comment. I enjoyed reading about your visits to Vienna cafes/coffee houses at www.slip-of-the-tongue.com. You were brave to down so much coffee, and the cost was surely not trivial. I have not been to Cafe Frauenhuber, but will visit it the next time in am in Vienna. I would have recommended a stop to Cafe Sperl on Gumperdorferstrasse. About Vienna: I spent the 1967-68 and 1971-72 academic years in the city. At that time, it seemed ruled by aging Hausfraus who always seemed to have a long, short dog walking beside them on a leash. Many, of course, were war widows. In those years, the city -- with a very homogeneous population -- closed down before 10 pm. Present Vienna is a great improvement over that, with a much younger, international, and energetic feel. Because the city is no longer the capital of a huge empire, it no longer attracts the most talented writers, musicians, and artists from the Austro-Hungarian region. Nevertheless, it seems to me to do be pretty well in the arts for a small country.